4 years ago in Puppycide Leon Rosby Hawthorne Police Department Max Kathy Brown Vicente Vaquerano Keri Modder trial ~ read. 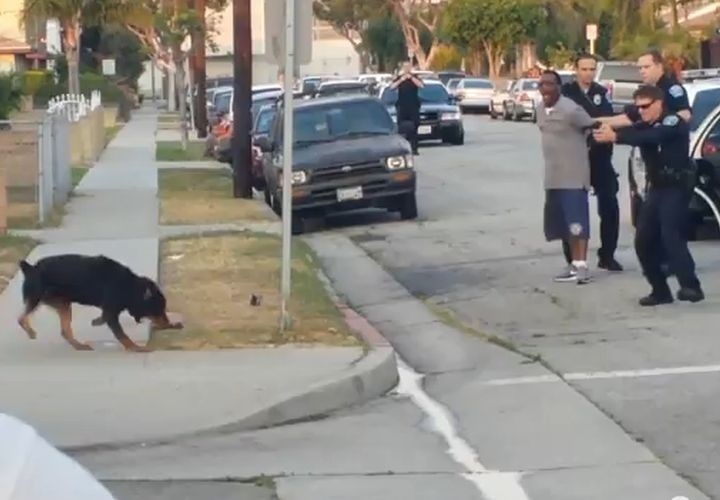 The shooting of a dog named Max by the Hawthorne California Police Department, and the subsequent arrest of the dog's owner Leon Rosby, is one of the most well-known and widely-circulated puppycides by municipal police. A cell-phone video of the killing went immediately viral on Youtube, catapulting the story into national circulation. A picture of a restrained Rosby crying out as a policeman takes aim at his dog even graces the front page of PuppycideDB.Com. At the time of the killing, Leon Rosby had a pending excessive force lawsuit against the Hawthorne Police Department, concerning an unrelated incident in which Rosby alleged Hawthorne Police beat him without cause. Leon Rosby's trial, which began February 26th, is only partially concerned with what occurred the day police shot Rosby's dog Max. At the time of the shooting, Rosby was arrested for a single misdemeanor count of resisting arrest (the previous phrase, an "arrest for resisting arrest", strikes us as both unfair and a depressingly commonplace event - Ed.). In the months that followed, the attention surrounding the case and the pressure one the City of Hawthorne and Hawthorne PD grew exponentially - the number and severity of the criminal charges against Leon Rosby experienced the same inexorable trajectory. At Rosby's arraingment, Deputy District Attorney Keri Modder filed an additional six felony charges against Rosby, all stemming from a series of alleged interactions between Rosby and two people who live near the scene of Max's shooting - Kathy Brown and Vicente Vaquerano. The State claims that Rosby issued a series of threats toward these two individuals: telling Vicente Vaquerano "If you snitch to the police, it’s going to come back on you," while Rosby apparently "Mad-dogged" Brown after calling her a "snitch" ("Mad-dogging" is a slang term to stare someone down, and was the term used in deposition, which is why we reproduced it here). Throughout the trial, it remains unclear as to what Brown and Vaquerano were going to "snitch" about, exactly. At the time of the shooting, Rosby was only to be charged with a misdemeanor charge of resisting arrest - particularly given the existence of comprehensive video evidence, no witness testiony would be required for a conviction (Rosby would have known about the video, as did millions of other people). Vicente Vaquerano was one of two individuals who captured the shooting of Max on video. Unlike the other individual who filmed the events, in Vaquerano's version you can hear Vaquerano yelling "Shoot, shoot!" as he apparently beseeches police to use deadly force against Leon Rosby's dog. Vicente Vaquerano was not attacked by Max, and was not in any immediate danger of being attacked during the course of the recording. Both Kathy Brown and Vicente Vaquerano testified this week as part of Leon Rosby's trial. That testimony was explosive. Kathy Brown testified that she lied when she told police that Leon Rosby had threatened her. "Anything I said [Leon Rosby] said to me is a lie." "I asked him why they were messing with me so much. He told me the dog being killed was a misdemeanor. In order for him to go to trial, they had to have a felony." There has yet to be a statement from police or the District Attorney's office as to whether Brown will face charges for filing a false report or obstruction of justice. The day after Kathy Brown's testimony, Vicente Vaquerano took the stand. Vaquerano told jurors how on July 7th, Vaquerano overheard Leon Rosby arguing loudly with Kathy Brown (Vaquerano and Brown were next door neighbors at the time). He claims that he went outside, at which time Rosby threatened him. Vaquerano also said that Rosby returned later that day to argue further. There are concerns surrounding Vaquerano. First and foremost of those concerns is that Vaquerano was paid for his testimony. The Hawthorne Police assisted Vaquerano with filing a claim for payment from the California Victim Compensation Program (CalVCP). At the time of this writing, the Puppycide Database Project has filed a public records request with the California Victim Compensation & Government Claims Board to determine exactly how much money Vaquerano received. Our request has yet to received a response. Local newspaper The Daily Breeze has reported that the justification for the payment was to relocate Vaquerano and his girlfriend; essentially, this was a sort of "witness relocation". However, the other "star witness" for the prosecution, Kathy Brown, received no such funding. Funding through the California Victim Compensation Program (CalVCP) is not disbursed as a quid pro quo for testifying on behalf of the state - it is earmarked for victims of crimes, whether or not they testify (and even when the defendant is not convicted). Why did Vaquerano receive a payment and not Brown? There have been other problems with the two witnesses for the prosecution in the Rosby trial. At least one felony count against Rosby was dropped when prosecutors failed to provide recordings of Vicente Vaquerano's interviews with police over to Rosby's lawyers. The mishandling of witness interviews would be highly suspect in any circumstances, particularly during a case that is completely based on the testimony of those same witnesses. When viewed in conjunction with the money that Vaquerano received, questions about the competence and ethics of the Hawthorne Police Department abound. "It seemed unfair anybody was against the police." That interview came up when Brown was testifying at Rosby's trial. Those who viewed the interview, which was published on Youtube, did not agree with Brown. During cross-examination by Rosby's lawyer, Brown said that she received a tremendous degree of criticism for the interview. It's worth noting that such an interview would be a good reason to lie about Rosby - it would also be a good reason for Rosby to threaten Brown. Deputy District Attorney Keri Modder rested the prosecutorion's case yesterday. The defense, lead by Rosby's attorney Mark Geragos, will begin offering their case soon, perhaps as early as tomorrow. It is also expected that Geragos will announce this morning whether Leon Rosby will testify on his own behalf. The prosecution's case as argued by Modder has been an unequivocal disaster. Geragos will be hard pressed to do a better job at poking holes in the State's case than Modder has done. The Puppycide Database Project will continue to follow the case and keep our readers updated. Before we sign off of this post, there is one question worth entertaining. This trial does not concern the shooting of Max: why should the Puppycide Database Project be focused on it at all? It's a fair question that has plenty of room for well-considered yet differing opinions. Given the circumstances of the case, we feel we would be remiss not to pay attention to what is happening. As the trial develops, it becomes increasingly reasonable to suspect that the Hawthorne Police Department sought and obtained inflated charges against Leon Rosby in order to deflect attention from their (mis)handling of Mr. Rosby's dog Max. Max, a leashed dog who had injured no one, was shot at least four times and left to bleed to death in the street. The shooting remains highly controversial and unpopular: millions of viewers have seen the video, and even the hacker group Anonymous expressed their disproval for the Hawthorne PD by temporarily forcing the police website offline. As our research into the phenomenon of puppycide continues, we have seen a significant trend among families of puppycide victims. This trend is a statistically signifcant pattern of harrassment and intimidation for family members who speak to the press, bring lawsuits or attempt to organize protests. It is possible that Rosby intimidated witnesses in a misbegotten attempt to extricate himself from a criminal charge of resisting arrest. It is just as possible that the police sought to extricate themselves from a public relations disaster by making Rosby out to be a violent thug. The police shooting a dog.